In 2004 Shelley Jackson launched her project SKIN, a story published in tattoos on 2095 volunteers. One of those volunteers is one of Omnia Vanitas Review‘s very own lovely editors, Ms. Lily Robert-Foley. This is part of that story as told through those voices and read on their marked bodies with their own stories. What’s so fascinating is how each word, already inscribed on a text, moves through texts, bonding to and inserting itself within other texts, exists outside of both their own text and Jackson’s texts, creating a third text of immeasurable size and weight, leaving the reader of the word, the wearer of the word, aware of the inevitability of natural erosion. Rebutting the claim that “writing is words that stay,” this story moves, it breathes, it hurts, it loves, and, eventually, it dies. From this time on, participants will be known as “words”. They are not understood as carriers or agents of the texts they bear, but as its embodiments. As a result, injuries to the printed texts, such as dermabrasion, laser surgery, tattoo cover work or the loss of body parts, will not be considered to alter the work. Only the death of words effaces them from the text. As words die the story will change; when the last word dies the story will also have died. The author will make every effort to attend the funerals of her words. It rings. And rings. We can now silence it, but before, we couldn’t. We could only take it off the hook. Ignore that beepbeepbeepbeepbeep. But still, most of us don’t. Most of us want the telephone to ring. We assume it will ring, and when it does, we run to answer it, like Pavlovians. Ring. Hello? You there. Hello? The mind to body connection is astounding. Ring. Phone in hand. Hello? It’s instinctual. Like pulling your hand off of a lit stove. Hello? Talk to me. Women wait by the telephone. (Though now, women wait for the telephone, as they are mobile, wireless devices, no longer stuck inside the home.) Everyone has waited by for the telephone. I’ve waited by for the telephone. Hoping he would call. He, the proverbial he. Hoping he would end my suffering and call. Sometimes he didn’t. Often times he didn’t. Busy, the predominant emotional state in men. The words go through a machine then come out differently. They sound differently. The inflections are all wrong. The inflections are faceless. Expressionless. Without eyes. The words are interpreted. The machine spits out what he said and I reel it in and translate it. He was busy evokes a tree of translations. He was writing. He was out with someone else. He was doing something, anything, other than thinking about me. This is not a post wherein I discuss past relationships’ failures. This is dissection of the telephone. Or, as Cixous calls it, the Tele-Vaccination. Because his voice can be an injection. It can calm the storm. Weather the war within. It penetrates our ears. The telephone is an appendage that abates loneliness. Ring. Hello? I’m here. 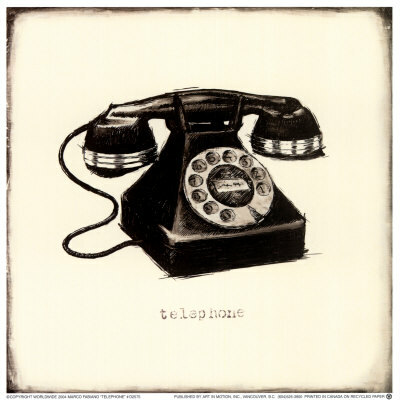 The telephone used to be my savior. In college I used to get nightmares. Horrible nightmares where my friends, my family, me were being brutally murdered for sport. I began reading Sartre’s Imaginary. He said that one cannot reflect in dreams, that when one starts asking questions regarding a dream’s authenticity as dream then one could effectively control their dreams. That night, I dreamt that the outdoor Pedestrian Mall was carpeted. I was walking along the ordinarily cobbled street but feeling the scratchy, clean fibers underneath my bare feet when I thought, The Ped Mall wasn’t always carpeted, was it? No, it most certainly was not. My dreaming self took out her cell phone. She pressed some buttons and called a lover whom she wished to see, whom I, the dreamer, had wished to see. My absent lover. The lover that didn’t always call. 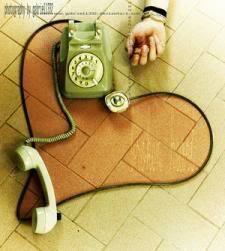 My lover that existed through the telephone. This became a repeated gesture throughout my dreams during this period in my life. If a threatening man appeared in my dreams I would take out my cell phone, dial him, or some number, some friend, and the contact would see me through to a different scene. The phone eased my suffering. Just as it did when my lover called. The phone would ring. His number would appear, and that number, without fail, was never Hello? it was always Tonight. Later. You will get to see me tonight. His number, his ring, eased my longing. His ring never wanted to talk. It wanted to penetrate. Cixous asks, why is there no painting of a woman waiting by the telephone? A woman waiting to be translated, to be understood. Waiting to be heard without being seen. Both of these, she knows, are impossible. To be heard is to trigger memory. He may be hearing me, unable to see me, but he is thinking about me, imagining my face, my body language as he deciphers my emotions, decodes blindly, with memory, with translation. To be translated is not to be understood. And, what about the game Telephone? The first person is the speaker, the last the listener, and everyone in between represents the machine, the device that words must travel through. This is how we end up with “purple monkey dishwasher” tacked onto the end of the sentence. The device is not pure. The machine is dirty, it crackles, words mutate, fall through its static. Lily and I are writing a book on the Telephone. Or rather, it’s called Telephone. She writes. I translate. She translates. I write. We began this project because she’s far, too far for the telephone to be affordable. So we write, letters, but with a keen awareness of the Telephone-Other that is not there but would be if we were on the telephone. I look at your text, your words, and I read them aloud. To illuminate, and to disappear: used as both verb and noun. One syllable crashes into another, leaving the former a memory. A memory that is never remembered accurately, like a feeling. The Telephone is a trauma box of mine. The pain is stored inside of its receiver. The fear that the other person is not hearing me right. That their translation of me is inaccurate. That I translated inaccurately. But also, that they are not there, not listening, playing video games, setting the phone down. Walking away as I speak. I have anxiety about the facelessness, the earlessness of the telephone. That my presence is unwanted, an interruption, an intrusion. This explains the excitement for the ringing phone, for the gentleman caller. Ring. Hello? I want to talk to you. The telephone is a reward for good behavior. Its removal is a punishment. This is when the telephone became sacred. Because of this, because of my absent lover, I adopted surreptitious telephone habits. The telephone became a secret. The telephone became a symbol, a portal to an affair. The gentleman caller is a voice without a face. He could be anyone to anyone else, anyone other than me. He is a secret. His phone call is also a secret. But they can’t hear. Only the one with telephone can hear. Ear pressed against the device she hears words only spoken for her. These words can bring forth demands. They can be exhausting, annoying. Ring. Hello? Do this. Ring. Hello? Explain yourself. Ring. Hello? Give me your time. Or then, the fantasy, the desire to be loved, to be missed, to be heard. Ring. Hello? I love you. I love you too. But what if these last two quarrel. What happens when they’re at odds? Ring. Hello? I love you, she says. Give me your time, he hears. No, he says, and she falls, rejected, sad. He’s confused, that’s not what he meant. He meant he was busy. She dissects “busy,” as she’s wont to do. Still paranoid, still assuming refusal, dismissal. He becomes angry. A cycle. A series of misunderstandings. Miscommunications. Meaning lost inside the machine.